Like you, your dog’s nails grow continuously and require routine maintenance. If the nails are too long, they can cause the feet to splay (spread out) creating discomfort and possible deformation of the foot. 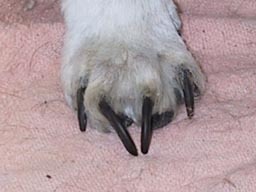 Nails can actually curl under the foot and pierce the pads at the bottom of the feet and require a trip to the vet. Severely overgrown nails can cause a variety of problems including broken nails which are painful and bleed profusely. Long nails can break or split, a very painful condition that can become infected. Overgrown nails become “needle” sharp inflicting injury on you and your pet and can get caught in carpeting and upholstery. Trimming your dog’s nails is important for your dog’s overall health. Your dog’s nails should be examined every 3 to 4 weeks. 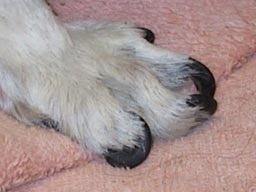 A dog’s nails should barely touch the ground and should not click when walking on uncarpeted areas.